You can organize your workspace to suit your needs. Customization of the workspace will be covered during class lecture. PC units may revert to default tool settings after closing. MAC units will maintain current workspace after closing. Not covered in class – feel free to explore on your own. The Tools panel can be accessed by selecting in the Menu Bar Window>Tools. To view related tools in the same set, click and hold on icon or ALT-click/OPT-click or right-click the mouse. Use letter shortcut for fast access (except when using Type tool). If Use Shift key for Tool Switch is unchecked in Preferences>General, use the letter-shortcut to cycle through Tool set. If Tool Switch is checked then hold Shift Key and letter short-cut to access Tool set. To use a tool temporarily while another tool is selected, press and hold its letter short-cut key. This allows you to use that tool until you release the selected key. This can be a bit tricky if the both tools are in the same set. In this event, the tool will switch to the current setting. Pre-selecting the alternate tool is suggested. Some of these tool panels we will delve into entirely, others we will barely consider, still others we will ignore all together – but feel free to explore on your own. Allows you to create production steps to automate your work flow. Great tool to use when batch producing thumbnails. (Not covered in book). Allows for color and tonal adjustments without altering the image permanently until merged with the underlining layer(s). The settings can be edited or deleted as desired. They automatically have a mask so specific areas can be adjusted. Displays a list of color channels such as RGB or CMYK – mostly for commercial pre-press print work. 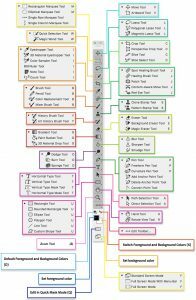 Attributes for the Type tool which can also be accessed through the Options bar. Organize and control multiple sources when cloning. Edit, scale, move & rotate up to five different sources. 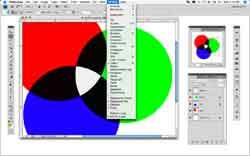 Choose a color model, mix colors and use the Color Picker . Reverse your editing as far back as 999 steps (default mode). By using the History Brush or Art History Brush you can designate a specific place in the history line to restore. Depending on which tool is being used the Info panel will show color information, X,Y coordinates, dimensions, distances or related transformation information. Can also be used to take up to (4) color samples for color management. Allows you to save Layer Compositions to be accessed later for presentation purposes. These comps save with the file and can be accessed later. Create, edit and manage the layers within a document. Link, group, merge and delete. Adjust and add effects to each layer as desired. 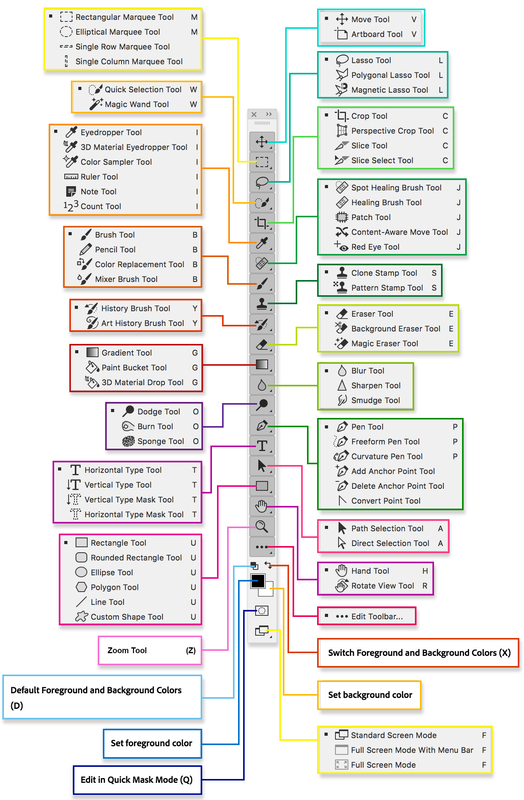 Smart Objects (make a change in the PSD file and the original AI & PDF files will be altered). Add pixel, vector or filter masks to layers. Also includes a Density slider and a Feather slider. Used to find your way around a magnified document. Slider allows for changing zoom level. Apply paragraph attributes and formatting to a type layer. Use with the Pen tools to make detailed selections which can be saved for later access. Add vector shapes and fill or stroke and export to AI. Collection of unique layer settings which can be applied as desired. Style libraries are included. Large assortment of color swatches which can be appended using the extensive Color libraries. Or mix your own using the Color Mixer and add to the swatch selection as needed. Create and manage specific tool settings which can be accessed at a later date. Allows you to accurately measure and record dimensions and distances between elements in the same document. A great tool to use when making Red-Lines (assignment #9). Make post-it type notes to yourself or another designer that can be shown, hidden or edited as needed.